Cooking whole fresh fish is something I rarely do due to the disappointing fact that it's hard to come by. Given our island status, I find it hard to believe that bar St George's Market on a Friday & Saturday morning options of where to buy fresh whole fish are few and far between. As a regular visitor to Spain, there are fewer meals I enjoy more than whole Dorada cooked on coals with garlic and Olive Oil. With a rare opportunity to visit the market I got two whole Sea Bream in an attempt to replicate those sunny Andalucian afternoons. I Paired the fish with Charlotte potatoes power-boiled then fried with Guanciale along with cooked crab tails and a few complimentary langoustines (shout out to the fishmonger) which were also thrown on the grill. 1. The First step is to power-boil the potatoes, cut in half and cook in salted boiling water for 8 minutes. 2. In a cast iron skillet add the finely chopped guanciale and fry on high heat until the fat starts to render. 3. 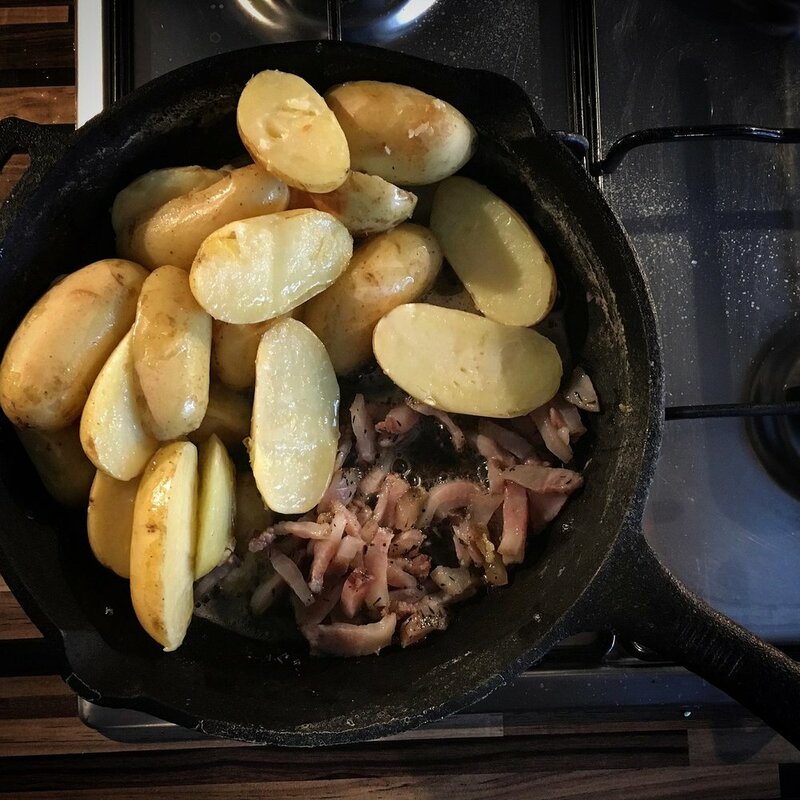 Add the rosemary and potatoes to the skillet and coat in the rendered guanciale fat and cook on medium heat for 20 minutes stirring occasionally. 4. My sea bream came scaled and gutted so all was needed was to slice the flesh so the heat could better penetrate and allow the seasoning to do its job. Season with sea salt and pepper and a drizzle of olive oil. 5. Preheat the grill to high and simply place the fish straight on the grates. If you have a fish basket it's handy but not entirely necessary. 6. Once the fish is placed on the grill lower the heat and cook for around 5 minutes per side. Ensure you don't touch the fish until the 5 minutes is up as you want the skin to crisp so as it stays intact. The more you move and play about with the fish the more it will stick to the grates. 7. While the fish is cooking get a small saucepan and make the sauce. Add the olive oil and melt the butter on a low heat then add the garlic which will begin to lightly fry. You only want to cook the garlic for 30 seconds otherwise it will start to burn and taste bitter. To stop the frying process add the juice of 1 lemon, mix well and finish by adding finely chopped parsley which will add freshness to the sauce. 8. 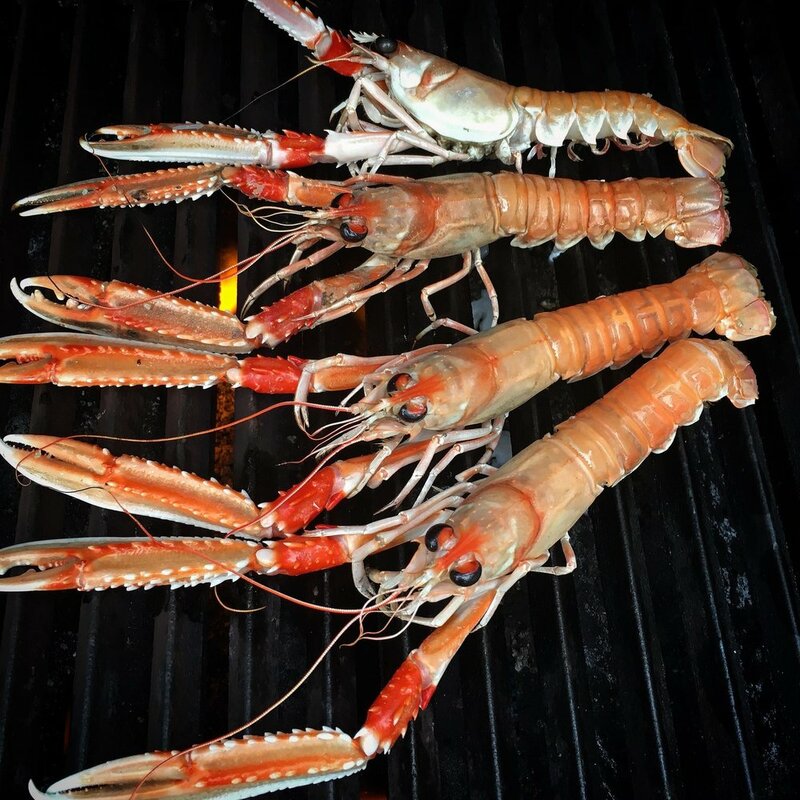 Cooking the langoustines couldn't be simpler, turn the grill up high (the opposite side to where the fish is cooking) and place straight on the grill for 4 minutes. Cooking them whole in the shell will prevent the high heat from damaging the meat as they steam inside their shell producing a wonderfully moist and sweet flavour. 9. If you are also being greedy and serving crab claws simply wrap in tin foil along with salt and pepper, a knob of butter and a squeeze of lemon. My claws came pre-cooked so just needed to be heated through which took around 10 minutes on high heat. 10. Drizzle the buttery lemon sauce over the fish, serve on a massive platter and dig in!